SpaceX founder and CEO Elon Musk posted this photo on Instagram on April 8, 2018. It shows "the main body tool" for the company's Mars-colonizing BFR spaceship, along with a Tesla car for scale. SpaceX's Mars spaceship apparently won't be a mere concept vehicle for much longer. 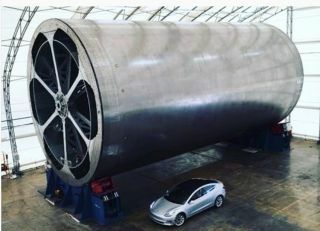 On Sunday night (April 8), SpaceX founder and CEO Elon Musk posted on Instagram a photo of "the main body tool" for the BFR spaceship. The company is building this craft to take people to the Red Planet and other destinations throughout the solar system. And that's just for the spaceship, which will likely accommodate 100 or more passengers at a time. The BFR will also incorporate a rocket, which will feature 31 Raptor engines and be capable of lofting 150 tons (136 metric tons) to low Earth orbit. The BFR rocket-spaceship combo will stand 348 feet (106 m) tall when stacked together, Musk has said, and both components will be fully reusable. SpaceX has said it plans to use the BFR to help establish a million-person city on Mars, ideally in the next half-century or so. The first crewed Red Planet mission could come in the 2020s, according to Musk. The new photo isn't the first hint of BFR progress that Musk has put out there. Last month, the billionaire entrepreneur said at the SXSW Conference in Austin, Texas, that construction of the first prototype BFR spaceship is underway. That vehicle could be ready for its first short test flights by the first half of 2019, he said. BFR is short for "Big Falcon Rocket," or a less family-friendly variant. The spaceflight system will be extremely flexible, and SpaceX has said it plans to use the rocket for a variety of purposes, from planetary settlement to satellite launches to point-to-point transportation of people here on Earth. Indeed, Musk has said that the company aims to eventually phase out its other rockets and spacecraft and let BFR carry the load.